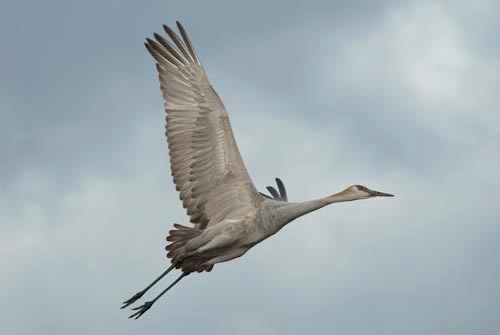 Ever hear a sandhill crane directly overhead? The voice is a warble with a prehistoric ring, the wings a primordial whooosh. These are sounds in evidence of lifecycles that have endured far longer than we. The birds visit New Mexico each year in an ancient ritual that maps their lives from the far northern reaches of the Rocky Mountains down to the deserts of the Southwest. 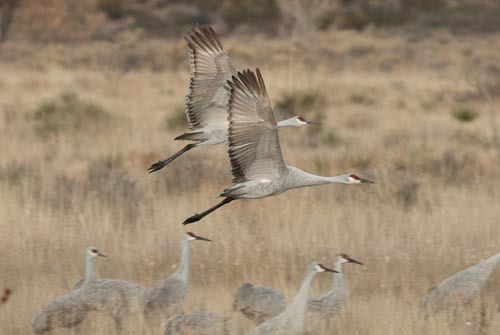 Just an hour south of our house, thousands of cranes (plus ducks and geese) gather in the Bosque del Apache National Wildlife Refuge, where the Rio Grande welcomes the world’s largest gathering of sandhill cranes. The refuge is strictly managed to provide ample water and food. 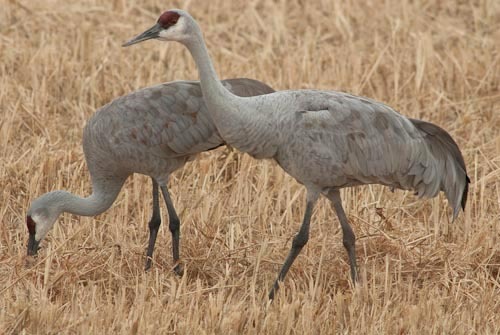 In earlier times, habitat loss along the Rio Grande posed severe threats to the birds; 70 years ago, only 17 cranes visited the region. 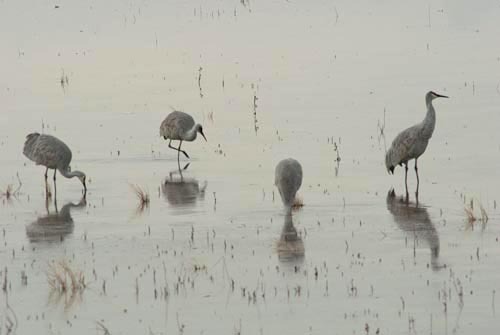 Although this river still has its problems, officials today count more than 17,000 cranes in Bosque del Apache. But I don’t have to drive anywhere to meet these birds. Several times a week, I ride my bike through the long stretch of forest bordering the river about a mile from our house. When I don’t cycle, I run, often along the acequias connecting farm to farm, neighbor to neighbor. Today, like many other days this fall, I encountered a congregation of cranes feeding in the fields along these waterways. They bob their heads and go about their business, almost oblivious to my presence. Of course, they know I’m there. But they seem to have learned through the years that sometimes humans mean no harm. And they seem to have learned, through ages of practice, that humans rely on the same waters as they; that farmers plant fields each year resulting in the diets cranes love: grains, tubers, mice, snakes, insects and worms. These relationships linking the water to the farmers to the birds have lasted centuries. I ride my bike along the Otero Lateral, an acequia dating to the 1600s (and marked accordingly with a sign). The early Spanish settlers followed the Puebloans before them, using a gridwork of irrigation canals to supply water throughout the desert region. Those same canals continue to feed people and birds today. I’m reminded of a spot, halfway around the world, in Cambodia. Something similar happens in the little village of Tmatboey, where endangered giant and white-shouldered ibises gather in ancient watering holes known as trapeangs, which date to the Angkor empire. Long ago, the ibises likely followed buffalo and elephant herds as these animals churned up the ground and created pockets where water could collect. Today, the wild ungulates are mostly gone, but farmers and their domestic livestock create favorable conditions for the birds. With their thin, elegantly curved bills, the ibises nose around the fields for insects, worms, eels and small crustaceans. Something happens when a bird this big flies away and I can feel the flap of its wings in my heartbeat. It’s as though my body shrinks in the shadow of an age-old system that has nourished more cycles of life than a single human can ever know.